With its warm climate year round and generally safe environment, Lanzarote is a great destination for children with a water park, horse riding, Rancho Texas theme park and crazy golf just some of the activities they can try. 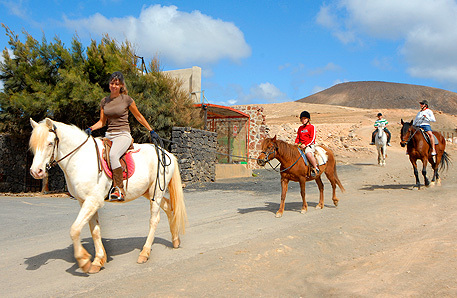 Lanzarote Caballo Found on the road to Yaiza, Lanzarote Caballo includes riding stables, play areas and games, camel rides and other animals although it is not a theme park. There is also a restaurant and bar. Aqua Park Found in Costa Teguise, just 10 minutes on from the airport, this small aqua park is located near the golf course. There is a cafeteria for snacks with a bar. Take a jacket as Costa Teguise is famous for the breeze. Can be chilly in winter time. Rancho Texas In Puerto del Carmen signposted along the sea front. By day a theme park with sea lions, pumas, reptiles, birds from all over the world, petting zoo, play areas, pony rides, parrot show, crocodiles and a not to be missed, a birds of prey demonstration. Restaurant for lunches. By night the ranch converts into a family night out with a cowboy and Indian theme. All you can eat BBQ and free flowing drinks. Family entertainment from the staff, line dancing display and lessons, lassoo show, live music, mechanical bull. Kids games in the tee pees and pony rides for children of all ages. Finishes with a disco until 11pm. Crazy Golf In Puerto del Carmen there are two crazy golf courses. One is near the San Antonio Hotel and also has trampolines plus other games whilst the second one is in the Aquarium shopping centre on the sea front which also has amusements on the roof. Boat Excursions There are a number of boat trips and excursions that can be enjoyed from both the harbour in Playa Blanca and at the opposite end of the resort at the Rubicon Marina. The harbour in Playa Blanca is also the embarkation point for ferries to the neighbouring island of Fuerteventura.